George was a pioneer. A trailblazer. An icon. He was our saint. To celebrate the life of our much loved star, a beautiful mural appeared across a wall in the Inner West. It became a local shrine, bringing a smile to the faces of thousands of commuters who passed every day on the train. It stood for eleven months with no hint of complaint or controversy. The dark forces unleashed and forced upon our community by the Marriage Equality campaign changed that. One day after we heard YES, a day to celebrate and heal after the divisive campaign, the mural was destroyed in a series of attacks. 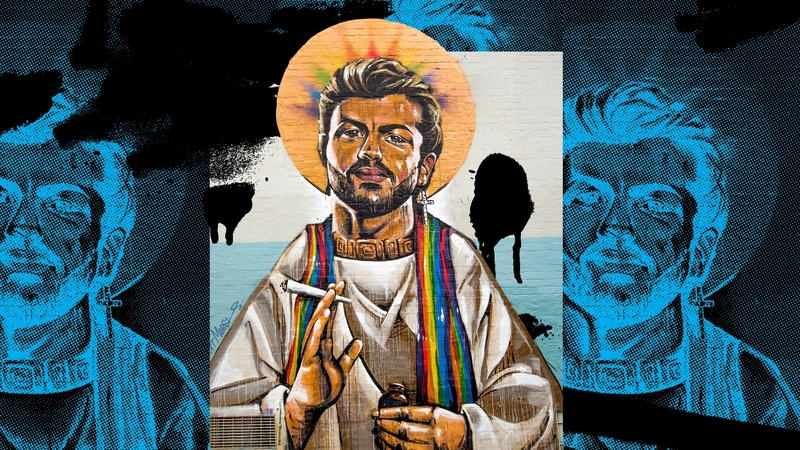 Two of Australia’s leading queer artists, pop icon Paul Mac and playwright Lachlan Philpott, have teamed up to tell the story of St George through the eyes of our community. This is a special opportunity to see this work as it is being made. Join Paul Mac and a choice selection of collaborators from across his career and a giant community choir for a sneak peek of this big new work. The Rise and Fall of St George is a celebration of our achievements, a thank you to the allies who supported us, and an urgent call to arms to never let these hard-won freedoms go in these dark times. After the show, a Q&A will involve the audience in a discussion about creating work inspired by real events, and how Paul’s music will continue to be informed by the experience.